LEAP is a special program that focuses on young parents between the ages of 16 and 21 and their children. It provides young parents who are receiving assistance through Ontario Works with the supports they need to finish high school, improve parenting skills, and achieve economic self-sufficiency. When a client is ready for a job, Ontario Works can help — with direct connections to employers who are hiring, information on how to prepare for an interview and job training. 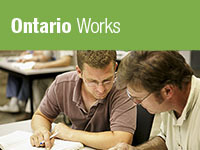 Ontario Works provides a number of benefits and financial supports, such as extended health benefits and prescription drug coverage, to help clients make the transition back to work.